Someone asked me to write something for them. Something nice about someone else. My brain wanted to do all the things, and wanted to go down all the rabbit holes at once. So I let the Things write a letter for me. They’re much smarter than me and have a way of getting to the essence of things without worrying too much. it took a few goes to boil things down to their essence, but I got there. And now I have written a second letter. This letter is for you and this letter is for me. I started writing it, and then I started to worry – maybe they should be writing ‘dear people’ or ‘dear entities’ … I didn’t like the idea of anyone missing out. But I didn’t want to lose specific things and I wanted to keep an open space for writing more letters later. And most of us are storyteller/writers in one way or the other. 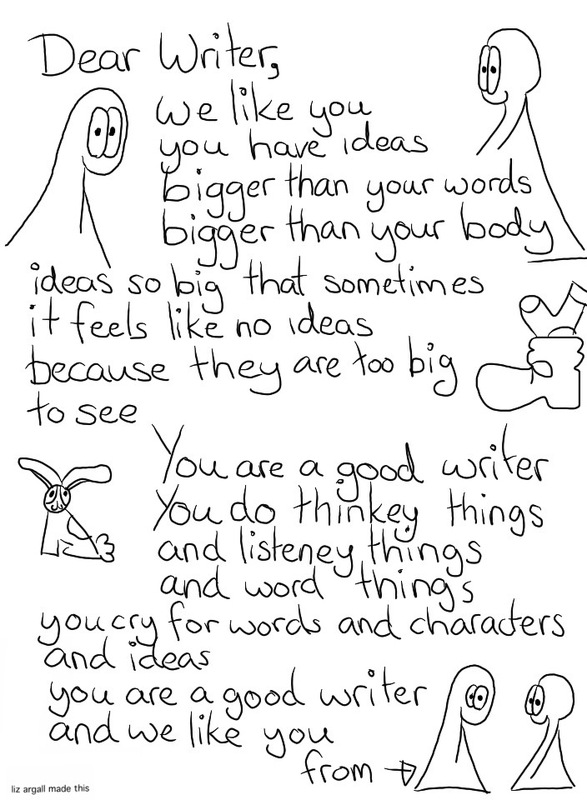 If you relate to the struggle of ideas and articulating/thinking them – then you can most certainly be a writer (unless you don’t feel like having that label because you feel it draws attention away from labels you like better – like artist, poet, storyteller, philosopher, scientist, community builder or…).